Journalists’ Forum Assam (JFA) expresses concern over the detention of Imphal based television anchor Kishore Chandra Wangkhem under the National Security Act (NSA) and demands his immediate release. However, the Assam based scribe’s body urges everyone, including the working journalists, to be careful while making crude comments in the social media. Wangkhem used to work as a news anchor in a local cable channel and was arrested by the Manipur police on 21 November after he uploaded a video comment in the alternate media condemning the governments in Imphal and New Delhi. Wangkhem even criticised the ruling Bhartiya Janata Party (BJP) for celebrating the birth anniversary of Jhansi’s Queen Rani Lakshmibai in Manipur and used derogatory words against the BJP’s ideologue Rashtrya Swayamsevak Sangh. Wangkhem was released on bail on 25 November by the local court, but soon he was rearrested and this time under the harsh act which might put him behind bars for 12 months unless the higher court intervenes on his detention. Notably, the young journalist was arrested by the police in last August in a similar case and was released after the intervention of local journalists. Commenting over the issue, All Manipur Working Journalists’ Union had clarified that it would not accept responsibility for a journalist making derogatory comments on the social media. The umbrella body of Manipur journalists said in a resolution that any person working in any of the media houses of the State as journalist/non journalist must face on their own the consequences of posting/ uploading derogatory, defamatory, illegal, unconstitutional comment/video on social media. Various national and international media rights bodies have already condemned the detention of Wangkhem and demanded his early release. JFA, in a media statement, appeals to Manipur chief minister N Biren Singh and also Prime Minister Narendra Modi to take necessary initiatives to release the television anchor and give him the opportunity for self defence. NSA detainee, Kishorechandra Wangkhem, told media persons today that the statement of the Jail SP published at various media houses today was half cooked and sugar coated story. The Manipuri Journalist, who was slapped NSA for his criticism to the present Government led by the BJP, spoke to the media persons today morning while he was on his way to the JNIMS Hospital to attend medical checkup. Yesterday, the Manipur Central Jail SP, S, Touthang, had clarified that Kishorechandra’s advocate claim saying that the Jail authority had not denied him meeting with his client however, he left while they were yet to complete the formalities. The SP also stated that all sectors inside the prison are provided Local News papers (1) Sangai Express (Manipuri), (2) Poknapham (3) Hueiyen Lanpao and National paper (4) Telegraph. Bullshiting the SP clarification, Kishorechandra while on his way to OPD JNIMS stated that the SP has been telling to media was a half cooked sugar coated story. “If you want to see the realities come and stay with me at the Jail just for one day and you will know the truth”, Kishorechandra told media while walking from another room to another room during medical checkup. The police team tried to take him away from media but he keep on talking what he wanted to the media. He said that even the Jail authority are collecting money from the Jail inmate for providing water how could one believe that the jail authority have provided library. “The Jail SP story is half cooked sugar coated story”, Kishorechandra said. Kishorechandra said that his arrest was arbitrary and the charges leveled against him were baseless as there is nothing such that my words have intention to disintegrate the nation. Kishorechandra further keeps his words saying that his detention is baseless and might have happened only at the time of Hitler. “I strongly denounced my detention under NSA, this is autocracy, dictatorial rule, they cannot simply arrest me for raising voice against them, Kishorechandra said and appealed the people to raise their voice against the government. Regarding the All Manipur Working Journalist Union Manipur (AMWJU) stand to his arrest, Kishorechandra said that AMWJU is sold out. The IJU has came down heavily to AMWJU, that proves AMWJU is doing what the government wants. Chief Minister N. Biren Singh has said that the State Government has started digging and dredging of canals which will divert flood water from Imphal River to Loktak Lake to check frequent breaching of river banks, which usually create lots of misery to public during rainy season. He was speaking to media persons at Phoubakchao in Imphal West District on the sidelines of the inspection of ongoing construction of these canals today. After personally overseeing dredging and fresh digging of Hayel Thongrambi canal near Uchiwa and Mangkhong and Lamboikhong canals at Phoubakchao, Shri N. Biren Singh conveyed that seven canals connecting Imphal River and Loktak Lake would be dug to reduce water volume of the river during rainy season. The Chief Minister further said that river banks of most of the major rivers frequently breached even at the slight rainfall during rainy season creating loss of property and life. In order to check this menace, the State Government had dredged parts of Imphal, Iril and Kongba rivers. As it could not give satisfactory result, the State Government directed the Water Resources Department, Minor Irrigation Department and Loktak Development Authority to ascertain major causes of frequent floods in the State, he said. The Chief Minister said that it was detected during the joint assessment that the old canals, which are supposed to divert flood water to the lake from Imphal River, were found clogged due to heavy siltation. Apart from it, the culverts located at the head of these canals were also found too narrow to drain away water from the river to the lake. So, the State Government decided to dig these seven canals apart from replacing of the existing culverts by 3-metre-wide ring culverts, he informed. It was also detected during the assessment that excess water from the confluence of Manipur River and Chakpi River could not be properly drained away to Chindwin River due to siltation at Sugnu Hump. As such, the Government is putting in effort to construct a 2-km long and 150-feet wide canal to enable proper diversion of flood water to Chindwin River, the Chief Minister said. Once these two projects are completed, floods in Manipur valley may be checked up to a large extent, he added. Responding to a query regarding Waisel Maril, the Chief Minister said that the State Government is willing to take up a fresh project for dredging and widening of Waisel Maril. For this, he appealed to the people residing on both the sides of the stream to voluntarily remove all the encroachments. Loktak Development Authority Project Director L. Bhagaton, who\ was accompanying the Chief Minister during the inspection, said that dredging and unclogging of Hayel Thongrambi (1400 metre) and Phoubakchao Mangkhong (960 metre) are almost complete while Mou Khong (580 metre), Phoubakchao Lamboikhong (605 metre) and Mou Khong Ichil (1200 metre) are yet to be dredged. Apart from it, two other canals near Thongrambi would also be constructed soon, he added. Deputy Speaker and Mayang Imphal AC MLA K. Robindro, Manipur Building and Other Construction Workers’ Welfare Board Chairperson H. Dingo, Yaiskul AC MLA Th. Satyabrata and Keirao AC MLA L. Rameshwor also accompanied the Chief Minister during the visit. While appreciating the decision in various state of India to waive off loan from farmers after the result of the recently concluded state assembly election, CPI (M) Manipur state today urged the government to take up the similar measures terming it as a welcoming step. “In the last couple of days governments in various Indian states after the recent State election results have waived-off loans to farmers which was a long pending genuine demand. It is a welcome step. Similar demands were made in Manipur by peasant organisations particularly by Manipur Loumee Marup where small farmers and agriculturists suffered huge losses due to the bad rainy season. This rainy season wreaked havoc on agricultural fields in many districts causing huge losses to the farmers”, said Kshetrimayum Santa, Secretary of the CPI (M) Manipur State Committee. He further added that Peasant organisations had written to the state authorities bringing into their notice this alarming situation. However, unfortunately the demand of loan-waiver in Manipur has not been fulfilled till today. It is high time that one-time waiver of KCC loans be provided to small farmers and agriculturists whose harvest was damaged by the bad rainy season. It would benefit lakhs of families who are directly or indirectly under tremendous pressure from the banks. The one-time KCC loan waiver can be considered as one of the components of the relief and rehabilitation plan that can give a sigh of relief to the farming community. The CPI- Secretary added. He further stated that Agriculture is the backbone of State’s economy and the \bad rainy season has dealt a blow to it. Under prevailing circumstances, it is an obligation for the government to come to the support and succor of the farmers and agriculturists as they form the backbone of the state’s economy. Given the quantum of destruction caused and massive damage to paddy fields, the Government should provide compensation keeping in view the recurring losses to the farmers. Due to huge losses in the production of food grains, farmers are not in a position to repay their loans raised against their farming land and agricultural fields. “We demand loan waiver on specified amount of KCC in favour of those farmers and agriculturists who are not in position to purchase fertilizers and pesticides for their farms and agricultural fields”, Santa drew the attention of the government. He however stated that there is also need for introduction and implementation of Crop Insurance Scheme (CIS) as it can save the farmers and agriculturists in the event of losses suffered due to natural calamities. It is unfortunate that the said scheme is not implemented so far in Manipur . Staffs of Thoubal Forest Division under the supervision of DFO Thoubal L. Debala and members of the CCNCS ( Centre for Conservation of Nature and Cultivation of Science) and WBCC (Wildlife and Biodiversity Conservation Committee) yesterday seized a gun used for killing birds and dressed birds from a hut makeshift hut from Ikop pat area yesterday evening during a hurriedly conducted drive. As per DFO L.Debala the gun and the dressed birds were found when the volunteers and official of Forest department, taking part on the two days One Night Bird Watching Camp while going out to watch birds at Ikop pat area. A two days one night Bird Watching Camp organized by Thoubal Forest Division under the aegis of National Mission on Himalayan Studies, Nature Learning Centre in association with Ningshing Lup, Tekcham and Wildlife & Biodiversity Conservation Committee (WBCC) since December 21 at Tekcham concluded today. In connection with the camp, all the students who have participated in the said camp were made to go on a round trip of Ikop Pat, Lousi Pat, Kharung Pat and Buffalo Farm to witness the life of different kinds of wild animals and birds including the migratory birds inhabited at the lake and imparted knowledge to the students on how to protect the birds and various others means to increase the population of migratory birds. RK.Amarjit DFO Central Division, K.Jugeshor Principal Kumbi College, L.Debala DFO Thoubal Division and Staffs of DFO Thoubal and various other people attended the concluding day while certificates were also distributed to 40 student campers who have come from different area under Thoubal Forest Division. Speaking at the occasion, L.Debala, DFO Thoubal said that the camp was conducted to instill the habit of bird watching among the youths and young students and to learn the various ways to identify the different types of birds during the camp. They was stay the first night at the office of Ningshing Lup, Tekcham and was make a tour around Ikop lake, Lousi lake and Kharung lake has watch the different types of bird during the camp while an environmental quiz was conducted for the participating students followed by screening of “Nature Film” as part of the camp. The air is thick with anticipation of the arriving Christmas festivals particularly in this State with a perennial presence of occasions for celebrations. That the people pour their hearts out in their celebrations might very well be a manifestation of their frustrations and hopelessness of the present situation. Wishes and messages of peace and harmony, not to forget development and progress will be doled out to the public with unerring accuracy and seemingly empathic statements, both by the ruling leaders elected by the people, as well as by those who have taken over the cause of fighting against the injustice and independence of the people upon themselves. The ideologies, have they been practiced as propagated, could have propelled this small state into a league of its own, one which the rest of the world would have looked up to for inspiration and guidance. The reality that lay around us couldn’t be more different or ironic. In spite of so many patriots and pioneers of freedom and justice, why is the common man in Manipur still could not live a decent life? Why is efficiency and hard work not being regarded with the same venerability as the ability to cozy up to power and riches? Why is fear and violence being viewed as the preferred mode of getting things done-for those who can, or profess to have the power, to unleash them? What is the meaning of peace and independence when the common people, far removed from the company of the powerful government, live in fear and uncertainty, deprived of their rightful stakes, their share of the benefits being utilized, albeit without their consent or knowledge, by the bureaucrats and heads of departments as well as those fighting for independence to further their professed cause of development, justice and independence? Why, despite the teeming guardians of truth and equality, the majority of the public is still reeling under injustice and oppression? Is extortion and use of force- lethal force at times a prerequisite for attainment of peace, freedom and independence? How do these opposing forces, purportedly working towards the same goal, envisage the participation of the public for which they are supposedly carrying out their pursuits when the trust and empathy have all but evaporated into thin air? The frightened feelings and uncertainty of the people should be allayed first. The change of guard in the government makes no difference. When 1528 cases of fact encounter or extrajudicial killing case in Manipur still remain pending in the Supreme court , another civilian was allegedly killed in police and AR custody. A journalist of the state has been arbitrarily detained in custody by slapping National Security Act (NSA) just because he spoke something against this government. The present practice of holding a gun to the head of the public while enquiring their allegiance will not work in the long run. Well not every human being is good. Some have criminal mind, some habitual offenders, some never bother for the suffering of others. Only few are beyond these perception and these few people are the one who will be remembered by the future generation. Fame and fortune by committing abusive activism fooling others will not last long. On the initial stage Kishorechandra arrest for his dissent to the government gets no support. 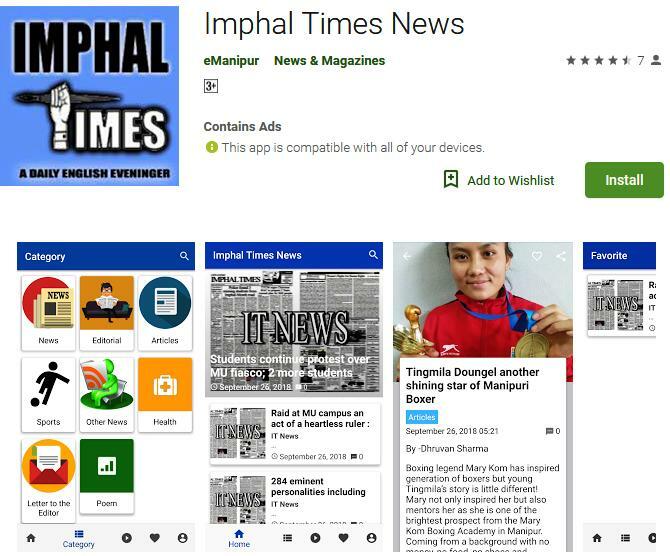 But with some including Imphal Times taking and another highly decorated Imphal based newspaper called Imphal Free Press have take the matter seriously and now the matter is taken as an issue by almost all the National dailies and electronic TVs. Yet the cry for justice by all the media across the country and abroad has been trying to mislead by some self style vested interested leader of Manipur based Journalists’ body by leaning to the government side , for reason best known to them. Everybody knows that, yet people of the contemporary days never bother what the future will say about them. One thing most believed is that – Live a life with comfort and luxury is the need of today’s contemporary society, Who cares after death? After all there is no guarantee that we will have a next live or not? If it does happen who cares, nobody is going to remember what they did in their last live. It is this perception that people of today did every odd thing to make huge money using any means even to the cost of somebody’s live. The Government should cleanse itself by correcting the wrong and not by forcibly making the wrong to correct using force by releasing Wangkhemcha Kishorechandra with an apology to the media fraternity across the world. This will be the only means to regain that dwindling confidence of the people by N. Biren Singh Government. Or else “the Little Dictator” which the Former Supreme Court Justice Markandey Katju called will be remember when ever N. Biren Singh names come up by the future generation. The main target of the study is to insight different issues of developmental schemes that many schemes have been implementing in the state but it is very much questionable on the achievement in the rural areas of Bishnupur District. It is also to study the issues and challenges of local self government in Manipur in general and Panchayati Raj in particular. Besides, there are issues of unable to submit utilization certificate by Rural Development and Panchayati Raj Department. Even in the administration there is lot of confusion that the issue of devolution of power is still alive. The Bishnupur District is one of the smallest Districts in Manipur, having a geographical area of 496 kms. and only three sub divisions. It has one Zila Parishad (consisting of 11 ZP Members) and 24 Gram Panchayats, 4 Municipal Councils and 3 Nagar Panchayats and 89 villages. Different developmental schemes have been implementing in the state but it is very much questionable on the achievement in the rural areas of Bishnupur District. There are issues relating to difficulties in implementation of certain schemes/projects, such as IAY (Indira Awaas Yojana), NREGS, (National Rural Employment Guarantee Scheme) SGSY, (Swaranjayanti Gram Swarojgar Yojana) IWDP (Integrated Watershed Development Programme), NRHM (National Rural Health Mission), SSA (Sarva Shiksha Abhiyan), PMGSY (Pradhan Mantri Gram SadakYojana), Food and Public Distribution, Banking, Youth Affairs & Sports, Minor Irrigation, Commerce & Industries, Water Supply and Sanitation, Fisheries, RGGVY (Rajiv Gandhi Grameen Vidyutikaran Yojana). Besides, there are issues of unable to submit utilization certificate by Rural Development and Panchayati Raj Department. (Sanjoy and Tomba, 2013). Mention may be made that under the twenty point programs of the government of India, the centre has been providing fund through Tribal Development Department for implementation of scheme to assist Schedule Caste families in Manipur. However, the actual implementation of the scheme is being taken up by Rural Development and Panchayati Raj/Zilla Parishads and the performance level has been recorded ‘nil’ following the failure of submitting the Utilization Certificates in time. Even in the administration there is lot of confusion that the issue of devolution of power is still alive. The local self government being organically linked and necessary power devolved upon them to enable to function as unites of self government for bringing all round development in the life style of the rural masses. The Gram Sabha, recognized as the basic unit of democracy consisting of all adult residents of the village, should not only deliberate but also participate with its executive, namely the Gram Panchayat, in planning and implementing various development programmes for causing socio-economic transformation. In Manipur we have two tire system of Panchayati Raj, i.e. Gram Panchayat at the village level and Zilla Parishad at the district level. The Panchayat at the both levels are involved in the implementation of centrally sponsored and state planned schemes for creation of community assets, infrastructure development and employment generation etc. in rural areas of the state. As a unit of local self government the Panchayati Raj Institutions play a vital role in the development of rural areas for poverty alleviation through the process of ensuring maximum participation of general masses by holding Gram Sabhas for preparation of Plans for economic development and social justice. The Gram Sabha is the general assembly of the adult villagers. It is through this forum that the rural poor, women and marginalized get an opportunity to participate in the discussion and expression of their views on common problems they face in their villages. The State Act., provides for not less than 4 Gram Sabha meetings in a year. In the dispensation of Panchayati Raj, the Gram Sabha takes the model of being a forum for direct democracy in rural governance. Characteristically, the Gram Sabha can be compared with the citizens’ forum of democracy in the ancient Greek-city-States. Active Gram Sabha is a must for participatory democracy and transparent village administration. Rather the Gram Sabha is to function as the basic platform of the Panchayati Raj system. Different studies are found on the concerns of local self government and Panchayati Raj institutions, some of the literatures may be reviewed as the following: Geeta & Sanjay (2017) analysed to understand the impact of the constitutional amendment on the empowerment of women. It is true that reservation for women in PRIs have opened up huge vistas for their empowerment, particularly women belonging to the weaker sections. However, there are many challenges and issues. Entrenched patriarchal system and mindset, rigid caste divide and rampant caste discrimination in the rural society, massive female illiteracy and female dependence on male have ensured that, by and large, the real levers of power are still in the hands of males. Studies have been cited to show that some of the southern and western states are far more advanced than the northern and some of the eastern states. The study found that women in Gram Panchayats represented highest in Bihar (54.6 per cent), followed by Manipur (43.5 percent), Karnataka (43.0 per cent), Sikkim (39.9 per cent), Arunachal Pradesh (39.4 per cent), Dadara& Nagar Haveli (39.4 per cent), Assam (39.2 per cent), Himachal Pradesh (39.1 per cent) and least in Kerala (30.3 per cent). Haokip and Ananda (2017) argued that decentralized governance is an instrument for multifaceted development and it can ensure effective and equitable development at grassroots level. This is because, locally elected representatives know their small constituency better and are in advantageous position to provide better services according to their electorate’s preferences. Development refers to the progress achieved in decentralized governance per se equitable and sustainable delivery of services to the satisfaction of the people. Effectiveness is understood as the ability of decentralized governance to produce results that meet the future needs of society while making the best use of resources at their disposal. Sustainability means the ability of decentralized governance to generate and to maintain the development process for a longer period. This paper focuses on the effectiveness of service delivery by the panchayats in the State of Manipur. Nico (2015) analysis revealed the increased status and role of local government, intergovernmental relations between the three levels of government have not only become more complex, but also critical for the demarcation of responsibilities and effective cooperation in service delivery. Although India has given recognition to local government in the 73rd and 74th amendments, the manner of allocation of powers to local government appeared crucial. When powers are granted by another sphere of government, the granting authority often perceives the transfer of powers as a loss of its own authority. Although local government powers are listed in the Indian Constitution, they are still dependent on allocation by the state governments, which has resulted in slow progress regarding the empowerment of local authorities. Stina et al (2015) argued that for inclusive growth, livelihood security and democratic empowerment as envisaged in the Mahatma Gandhi National Rural Employment Guarantee Act (MGNREGA), the state of Manipur is implementing the scheme with the mandate to provide at least 100 days of demand based guaranteed wage employment in a financial year to every rural household whose adult members volunteer to do unskilled manual work and creation of durable social assets in the process. Their study examined the performance of the scheme in that state with respect to extent of employment generation, efficiency in work completion rate and efficiency in fund utilization through analyzing official records. The finding shows that the shabbiest parts of the scheme were detected in the forms of provisioning of 100 days employment to only 7.39 per cent of job card holders and failure to complete 95.55 per cent of the undertaken works by scheduled time. This calls for playing of more responsive role by the state authority so that very purpose of MGNREGA is not defeated. Ishani & Suresh (2015) emphasised on the women members of gram panchayat and the changes in their involvement in politics particularly after the 73rd amendment of the constitution of India. The experiences and views of the members of panchayat are important for a successful rural development process. Most of the people are not well educated and easily get influenced or worked under the guidance of a second person, be it an influential male member or respective husbands of the women representatives. Some of the women came without even having the knowledge of local self-government but just to fulfil the privilege of reservation policies for women participation. This has definitely created many loophole in terms of using the funds as well as devaluation of the functions authorised to them. However, it is also true that some of the women representatives gained knowledge and confidence and became assertive in the politics of Panchayat and little scope has been given for them to try and make efforts for a genuine participation due to the lack of various social and mental inspirations or readiness towards the women folk of the Panchayati Raj System. The analysis suggested that there still needs to orient and encourage such women despite being very enthusiastic and vocal to bring confidence and assertiveness among them so that they themselves become the one who can play active participation in the decision making and administrative process of rural development. Sanjoy and Tomba (2013) analysis focus on Rural Poverty Alleviation Programmes: A Study of Mgnrega in Manipur, it revealed that the Govt. has implemented many rural development schemes such as the SGSY (Swarnjayanti Gram Swarozgar Yojana), IAY (Indira Awaas Yojana), PMGY (Pradhan Mantri Gramodaya Yojana), PMGSY (Pradhan Mantri Gram Shadak Yojana) etc. But this programme could not bear the desired reasons due to inconsistency between scheme aims, poor quality of asset creation, lack of resources and manipulation of the record. To overcome this problem the present paper, an attempt has been made to analyse the implementation of MGNREGA in Thoubal District of Manipur. Dipanjan, (2005) argument stated that the Panchayati Raj institutions were functioning only in the valley districts and Jiribam sub-division. In the hill districts, there were village authorities, almost similar to village Panchayats, functioning under the provisions of the 1956 Manipur (Village Authorities in Hill Areas) Act. The Post- independence phase of Panchayat Raj is marked with significant developments. Further the analysis revealed that there is also a need to re-look at the way Panchayati Raj Institutions (PRIs) are working in the North-East. The PRIs which devolves the powers to the people and promotes self-reliant and self-sufficient local institutions has remained defunct in the region largely due to overlapping laws and institutions. The constitution leaves it to the discretion of the states to devolve funds, functions and functionaries (3Fs) to the Panchayats. Under the Section 35 and 61 of the Manipur Panchayati Raj Act, 1994 the Government of Manipur have issued order for devolution of powers and functions to the PRIs for economic development and social justice relating to 22 like departments in conformity with the 29 items listed in the Eleventh Schedule of the constitution of India and approved the Activity Mapping in respect of 16 line department. (Shyamsunder, 2017) Out of which 5 departments, viz; Fisheries, Horticulture, Tribal Development (SC), Science and Technology, Rural Development and Panchayati Raj Departments only have transferred funds, functions and functionaries to the PRIs for implementation of water bodies to enable pisciculture scheme, for increasing agricultural production, land reclamation and development of Schedule Castes. Implementation of Rural Energy/Electricity project (IREP) scheme sponsored by Science and Technology Department has also been taken up in the four Valley Districts of Manipur. The Department of Rural Development and Panchayati Raj has been transferring their staff and funds to the PRIs for implementation of development programmes entrusted to them from time to time by the government. The remaining other line departments have been reminded to devolve their functions, funds and functionaries as approved by the government at the earliest. State finance Commission - with a view to ensuring regular flow of funds to the PRIs so as to enable them to discharge their functions the State Government had constituted different Manipur State Finance Commission in different years since 1996 to improve the financial position of the PRIs. Finance Commission Awards - Many infrastructural development changes were brought / initiated at the village level under the funding from the 11th, 12th, 13th, 14th Finance Commission. Under the scheme, maintenance of civic services and infrastructure development works, e.g., Primary School Buildings; market sheds; drinking water supply assets; street lighting; and cremation/burial ground. The 13th Finance Commission Awards further enriched living standard of the villages by taking up core services like drinking water, sewerage, waste management programmes etc. further, under the 14th Finance Commission Awards (2015-16 to 2019-20) during the year 2015-16, and 2016-17 work related to basic core services like sanitation, waste management etc. have been taken up successfully. (Shyamsunder, 2017). Sansad Adarsh Gram Yojana (SAGY) The Union Government has initiated a visionary scheme called the Sansad Adarsh Gram Yojana (SAGY) under the Member of Parliament Local Area Development programme (MPLADP). The scheme envisages to initiate building the Nation from the village level and develop one model GP/ Village in each of the constituency of the concerned MP by the year, 2015 and 2(two) more model villages by the year, 2019. In Manipur, 3(three) Model GPs villages were selected to initiate the scheme during the year, 2016. They are (i) Ngairangbam model village at Ngairangbam GP (Imphal West District) launched by the MP(IPC) Dr. Th. Meinya, (ii) Hayel-Hangoon Modet village at HayeL-Hangoon G.P. (ThoubaL District) launched by the MP (RS), Late Haji Abdul Salam and iii) Kangvai Model village (Churchandpur District, launched by the MP (OPC) Thangso Baite. The 4th Model Village has been initiated under the aegis of the District Rural Development Agency (DRADA), Imphal East by launching the Pukhao GP of Sawombung CD Block as the Model Gram Panchayat / Village on 18th March, 2017 by MP (IPC) Dr. Th. Meinya at Pukhao Khabam Community Hall. The scheme is regarded as one that actualizes the dreams of Rural India. The basic activities under the scheme will be to enhance the entrepreneurial skills of the indigenous and innovative villagers. Swachh Bharat Mission (SBM) / Total Sanitation Campaign is another scheme which is implementing throughout the India under NDA Government with a target to make India an open-defecation-free Nation by the Gandhi Jayanti Divas of 2nd October 2019. In the village level, PRIs and Village Authority are amongst the implementing agencies that they will select the beneficiaries. Sanitary toilets are provided as an indispensable civic infrastructural item to all the beneficiary rural households. The scheme is a distinct step towards creating an atmosphere for healthy and hygienic lifestyle in the rural areas. Under the leadership of P. Baleshwor Singh, Pradhan, Wangoo Terakhong Gram Panchayat, of Bishnupur District, has taken up many developmental programs under state and central sponsor schemes viz, MGNREGS, 14 Finance Commission, State Finance Commission, IWMP etc. The GP have 1995 members of household, 1413 members of household have their own land while 582 household are landless. Most of the people are farmers and labourers. The GP has 1856 nos. of Job card holders under MGNREGA. There is shortage of drinking water in the GP that 220 nos. of household gets drinking water from 3 numbers of public hydrant located in the GP and others remaining households gets drinking water from 13 nos. of hand pumps 9 nos. of ponds and 1 nos. of spring water tank constructed by the Panchayat and other departments under 14 Finance Commission and state finance commission. In regard to the District planning committee - The district planning committees for the four valley districts have been constituted by the government as provided under the state Panchayati Raj Act. However the District Planning Committees are not functioning properly. Adequate infrastructure development and manpower support for the four District Planning Committees are still lacking and these need to be put in place to initiate the functioning of DPCs. It is recommended by a committee of three men that constituted for the smooth functioning of DPCs under the aegis of Prof. N. Mohendra Singh in 2014. In regard to financial availability - To enable the PRIs to become financially viable and self –supporting the Manipur Panchayati Raj Act, 1994 under its Section 40 and 70 empower the Gram Panchayat and Zilla Parishads taxation within their Panchayat areas with the approval of the government. However the Punchayats do not have any income of their own and do not levy any taxes, fees, etc. at present. As part of streamlining income generation by the PRIs, which has become a burning issue, the Director, Rural Development and Punchayati Raj, during 2014, submitted to the government a detailed proposal containing all the relevant facts, figures regarding income generation by the PRIs in the state but still yet to approve. ·Implementation of MNREGS is still problem in Manipur that the record finding in the field investigation confirm that most of the PRIs cannot provide 95 days of work to the job card holders. · Beneficiaries can get direct benefit from the MGNREGS and PMAY while the state finance commission and 14 finance commission indirectly benefited to the villagers in the sense that different developmental programmes are undergoing through this SFC and 14 FC like watershed management, road construction, well and pond digging, repairing and construction of primary schools in deferent villages. An active Gram Sabha is a must for providing effective socio economic transformation in the rural areas of the State. The rural leaders and elected PRIs representatives will need to go all out to motivate their electorate-members to instil in them a firm sense of faith in the system of grass-roots democracy by way of ads, awareness generation with circulation of annual report of the Gram Panchayats showing income, expenditure and works taken-up during the year and even providing nominal remuneration to the participants as a token of acknowledgement for being present during the Sabha meetings. For, without the participation of the general public / electorate members, the deliberation of the Sabhas will remain incomplete and disputes unresolved thereby dislocating the true texture of participatory democracy. The member, representative is needed to visit other developed states to make them familiar with the working of more dynamic and responsive Panchayates. It is opined that such activities would help in motivating and reinforcing the working of panchayats in the home state. The Art of Living will hold a free session on how to manage the mind and live a stress-free, healthy and happy life on December 23, 2018. The one-hour session will be held at the Art of Living Centre, Keishamthong, Imphal from 4 pm. The session is open to all. During the session, trained faculty members of the Art of Living will impart wisdom and technique for managing the mind and living a stress-free, healthy and happy life. The session will look at the mechanics of happiness and sensitize the participants to the tendencies of the mind that robe it of its happy nature. It empowers them with simple skills to experience the power of NOW! As the saying goes, the mind is the best of friends for one who has conquered it, but for one who has failed to do so, the very mind is the greatest enemy. So learning to manage the mind adds a lot of value to life. “Like beauty is in the eyes of the beholder, happiness is in the mind. Happiness is so subtle that everybody wants it but only a fortunate few know how to attain it. Ironically, happiness is also the easiest thing to acquire for those who understand its subtlety. A few lessons on the mechanics of mind is all what it takes,” explains Imphal-based faculty of the Art of Living M Rajaque Rahman. “Stress is one of the main factors that stop us from living a healthy and happy life and being efficient and productive in our personal and professional life. This session will highlight simple avenues available for managing the mind and reducing stressors in the day-to-day life,” he added. Chandel Battalion of 26 Sector Assam Rifles under the aegis of HQ IGAR (South) conducted a heartwarming advent Christmas ceremony for all the villages of Pallel Town on 21 December 2018 at its church. The ceremony was graced by the presence of 46 village chieftains and pastors. The ceremony was officiated by Reverend Daniels of the Thamla Kurein Baptist Church of Pallel area of responsibility. He brought out the warmth and meaning of Christmas Spirit and also remarked on the strong need for unity amongst men against a sinful way of life. The ceremony started with an opening prayer followed by opening Christmas carols and ended with closing prayer and cake cutting. In his closing address, the ADIG of 26 Sector appreciated the presence of the chieftains and pastors, thanked them personally for their time and thoroughly appreciated the spirit of Christmas. The ceremony ended with facilitation of Reverend Daniel, 26 Sector choir, Tuisimi Choir Group and the esteemed guests of Pallel. The Chiefs, Pastors and Tribe Presidents appreciated the gesture and applauded the Assam Rifles for conducting a function which brought all tribal Christian brothers on one platform to prey and pledge for a better way of life.